If we ever get an MLK Records Act with a review board of some type akin to the JFK Records Act and review board Vince Hughes is someone they should talk to. 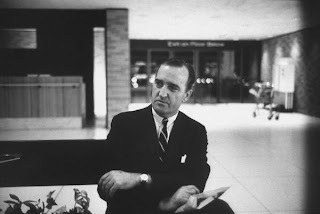 This is a LIFE magazine photo of Arthur Hanes Sr. He was James Earl Ray's attorney for a short period of time, from shortly after Ray's capture at Heathrow airport until just before a mini-trial, that wasn't really a trail at all. Hanes announced in Birmingham, Alabama that he had been phoned by Ray's British court appointed lawyer, Michael Eugene, that Ray requested him. Ray put this request in writing. However, Ray signed the letter using the alias he had when arrested, R. G. Sneyd. As I read Harold Weisberg's "Frame-Up," I wonder if Ray really did request Hanes at all. To me it's as fishy as Oswald's request to be represented by John Abt. Abt was well known for defending Communists and those labeled as Communist. So, if Oswald did request him it cements in the public's mind that Oswald was a Communist and probably acted alone. Here, the same thing, a man well known for his anti-civil rights background is to represent Ray and if Ray really did request him then Ray must have killed Dr. King on his own out of sheer racist hatred. Anyway, I'll give Hanes credit for taking it seriously. Hanes did go to London, where he was denied the right to see his client. After a few days of being denied any chance to see Ray he left. I think it is important to give as full of a biography as possible and to put people in context in the JFK and MLK assassinations. Even a casual student of these cases will see that the government and lone-nutter crowd far too often strips away the true context of who people are and why they are doing what they are doing. So, I want to point out that Arthur Hanes, Sr. was a one time Mayor of Birmingham, Alabama in the early 1960's when the city was a focal point of the Civil Rights movement. Hanes was the boss of Eugene "Bull" Connor, the man who used dogs and high pressured water hoses on civil rights demonstrators. Hanes didn't stop Connor, he encouraged Connor. Arthur Hanes, was a former FBI agent. Hanes said he quit the FBI because he felt he couldn’t express his feelings about the growing Communist influence in the country as an agent. So, he saw himself as more anti-Communist than Hoover. You’d be hard pressed to find someone more anti-civil rights than Hanes. So, who really hired him? How was he paid? Who paid for his trip to London and back? When asked about this Hanes replied, “Somebody will provide, the neighbors, or some way.” Weisberg writes, “Neighbors? In Missouri State Penitentiary, perhaps?" As a lawyer Hanes represented Robert Chambliss, accused of bombing the Sixteenth Street Baptist Church in which four young black girls were killed. Chambliss was convicted. Hanes also defended two KKK men, Collie Leroy Wilkins, Jr. and Eugene Thomas against charges of murdering Mrs. Viola Liuzzo, a white woman. The Wilkins jury was hung, and Thomas was acquitted. Hanes again represented these same two men against federal charges that they conspired to violate Mrs. Viola Liuzzo’s rights. They were convicted and sentenced to 10 years in prison. But wait, it gets better, Hanes was also a one time CIA contract employee. Bay of Pigs preparations took place in Birmingham. Weisberg devotes chapter five of "Frame-Up," to telling us something about Arthur Hanes. So, he wasn't just some lawyer.